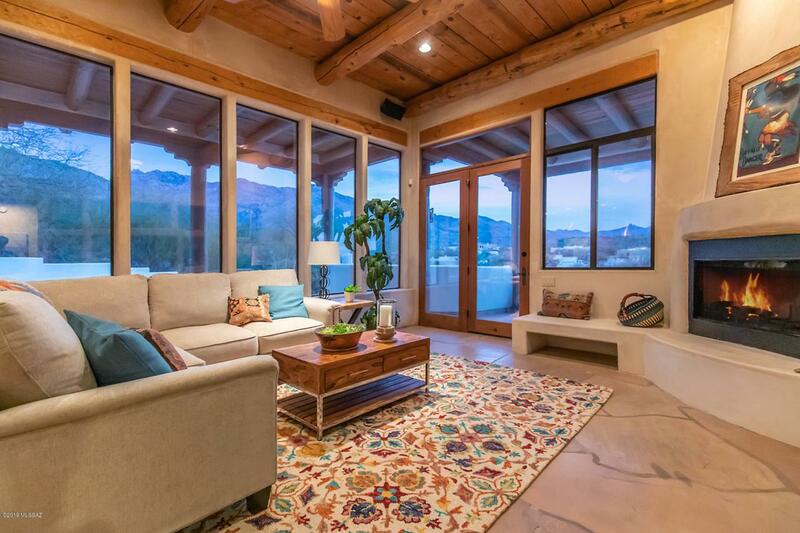 A spectacular Southwestern style home enjoying nearly 360* delicious views of mountains both close-up and wrapping around the Tucson Valley, gorgeous sparkling city lights, custom-built with walls of windows showcasing those views, is now available for the discerning homeseeker. Located In the desirable Alta Vista section of Tucson's famed Catalina Foothills, it offers abundant rich materials and finishes throughout: large-format flagstone flooring both inside and out on the many terraces, balconies and patios, elegant Venetian-style finishes on the thick stucco walls, Southwestern architectural details of vigas (wood ceiling beams), corbels (large wooden brackets supporting vigas), latillas (thin wood or cactus ceiling strips supported by vigas), lintels (wooden headers above windowsand doors), and canales (protruding drainspouts), five interior fireplaces and another outdoors plus a huge stone firepit, an additional den downstairs with warm and inviting stone-surrounded fireplace, lots of spaces to gather with friends and family, intimate spots for relaxation and quiet conversation... truly a special residence. In the tradition and spirit of Southwestern architecture, the construction uses materials honestly so they become design elements themselves, and breaks down the barriers between inside and out. The star of the show is those views, down to Mexico and all over Tucson, as was intended by the owner, who designed this home for his family. The tour starts up-on entering the rustic gate into the welcoming courtyard and being stunned by the views, which only get better by continuing around the balcony "parapet" that wraps the exterior of the one-of-a-kind home. The outdoor entry is a traditional "portal" in modernized form. 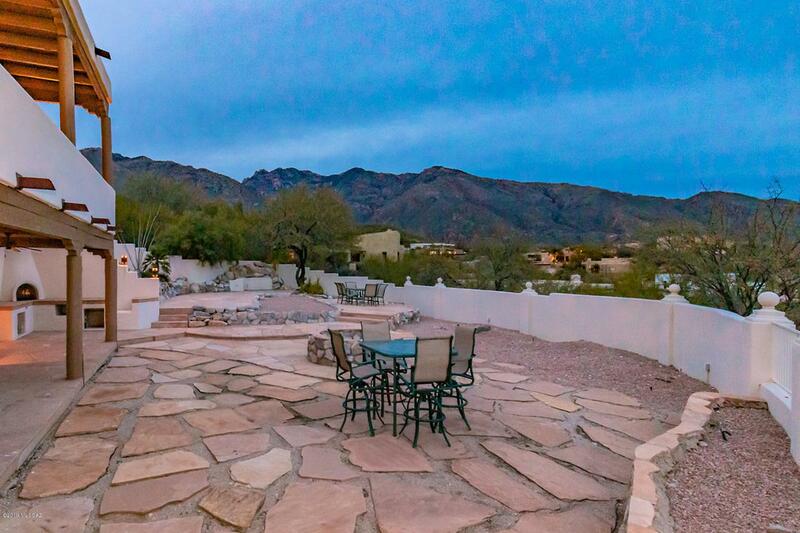 A dining room for those special occasions looks out over the Tucson Valley. A cozy living room has a deeply coffered ceiling, and provides a spot for quiet conversations, while the great room with its large beehive-style gas fireplace, bancos for casual seating, and walls of windows showcasing magnificent views is clearly the spot to gather and relax. The kitchen flows seamlessly and warmly from this comfortably spacious family room, with richly shaded and plentiful cedar cabinetry and a fabulous Garland stove and Bosch appliances. A bar seating area is hidden behind the Southwestern style pony wall. A huge island topped with butcherblock blends beautifully with the tumbled terrazzo counters and backsplash. The adjacent oversized laundry area is also a pantry with room for a substantial wine fridge. Two generously sized bedrooms with walk-in closets and an attractive full bath are adjacent. The master suite has a romantic kiva-style wood-burning fireplace (enjoy the fragrance of that mesquite on a cool evening!) tucked into a corner and doors providing views both North and South. An elegant master bath includes a generously sized Jacuzzi tub set upon a travertine surround, travertine surfaces throughout, elegantly separated vanities, and a walk-in shower with multiple water outlets and sprays to delight the senses. A walk-in closet has room for his and hers. 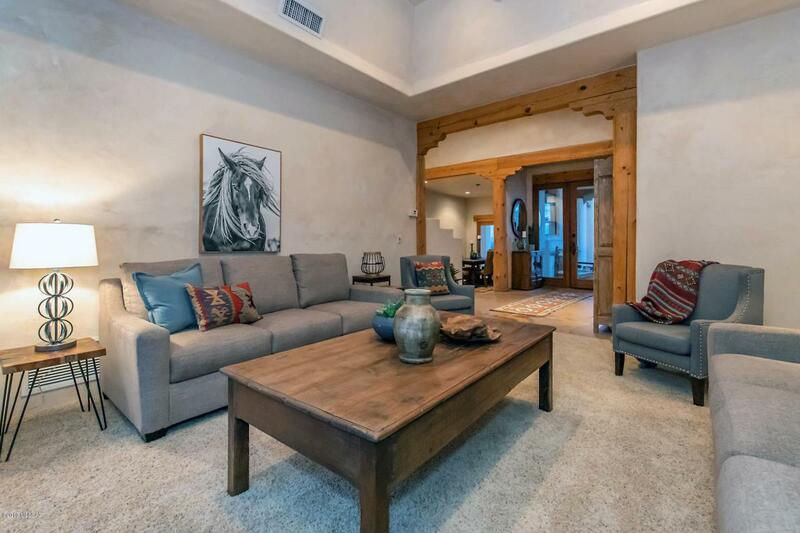 Downstairs is an entire suite of possibilities, with a den focused on a large stone-surround fireplace, a substantial wet bar with seating and room for a small fridge, lots of room for a pool table, and a bonus room that could be a terrific media room, office or workout space. Also downstairs is a well-sized guest room with its own fireplace and full bath. Outside is a huge curved terrace outfitted with a large stone firepit and another kiva-style fireplace or horno (based upon a traditional outdoor oven to bake bread), and room to entertain a crowd while enjoying sweeping sunset views. The city lights in the evening are memorable! This home has been lovingly cared for and maintained by the original owners and is now ready to be enjoyed by a new generation. With famed Catalina Foothills District 16 schools and easy access to the best of Tucson's shopping, dining, entertainment and medical facilities, this property clearly meets the "Location, Location, Location" test. Please call for your private showing. Al, 520-488-6088 or Sandy, 520 488 8318.